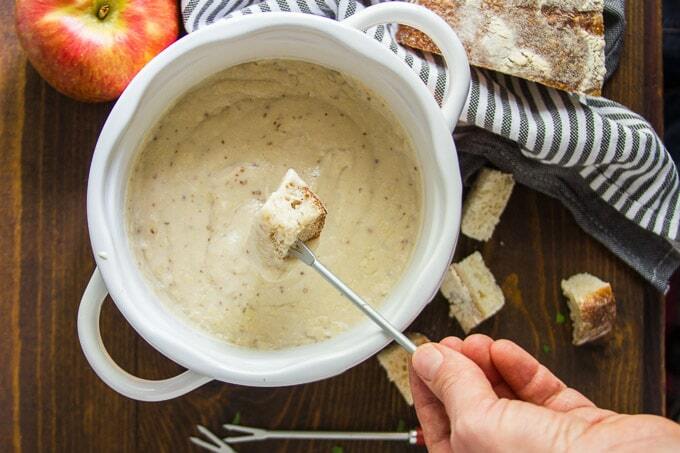 Vegan fondue is only possible, it’s pretty darn easy and incredibly delicious to boot! Smooth, creamy, and so luxurious…you’ll want to dip everything in this stuff. I’ve been wanting to make a vegan fondue for a while now, but I was a little intimidated because based on what I hear, fondue is tricky. I did a little research that seems to confirm this. The cheese separates, things get chunky, all that bad stuff. Well, good news! It turns out that fondue is one of those super cool recipes that’s actually easier to make in vegan form than traditional non-vegan form. Hooray! From what I can tell, the most popular variety of classic fondue is made from Swiss cheese. So that’s what I went for here. You can experiment with the seasonings and flavors a bit to try for a different type of cheese, and I’ll provide some tips on that below. But to start, give the Swiss a try. It’s simple, delicious, and a classic. 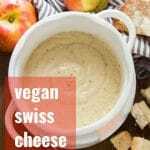 Like so many of my favorite cheesy vegan recipes, this one starts with cashews. Also, potato, which helps thicken things up. And a bunch of seasonings that make your potato cashew mixture taste like vegan cheese: garlic, miso, lemon, Dijon mustard and white pepper! Tapioca starch is the secret ingredient that gives the cheese that stretchy, gooey quality you want in a fondue. Blend everything up until it’s nice and smooth. The trick is to add just a small amount of non-dairy milk at the beginning, and thin it out with more milk then when you’ve got it to a nice smooth paste. And like regular old fondue, this one involves some white wine. Simmer the wine for a few minutes and then add your cashew potato cheese mixture. Stir until smooth and let it simmer for a few more minutes, until rich and creamy. Transfer everything to a fondue pot and start dipping away. People always ask me what type of blending device I use for this type of thing, so I’ll answer in advance. I used this Cuisinart food processor. But honestly, pretty much any old food processor will do, as long as you follow the recipe instructions. For cheddar, try adding some hot sauce (for real, it makes things taste cheddary). For a smoked cheese flavor, add a dash of liquid smoke or smoked paprika. 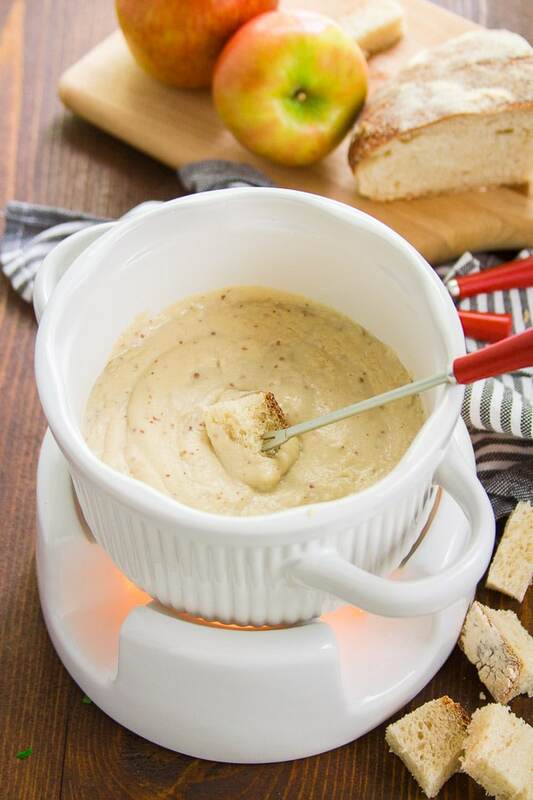 Try using beer instead of wine for a vegan beer fondue. 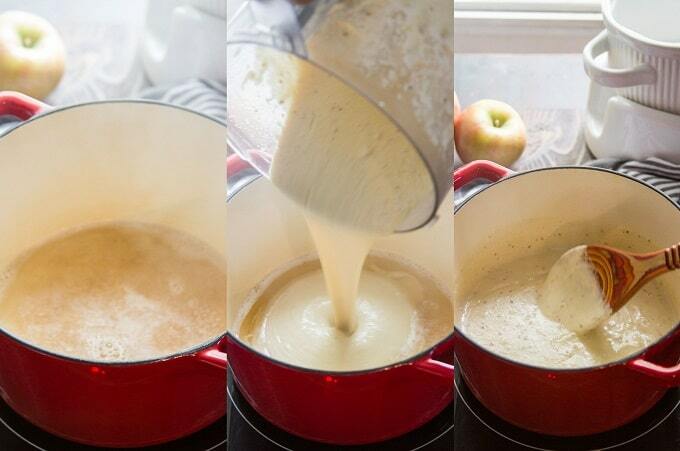 If your fondue gets too thick as it cooks or sits in the fondue pot, just thin it with a bit of wine or non-dairy milk. Not all wine is vegan. Check with Barnivore to make sure yours is. 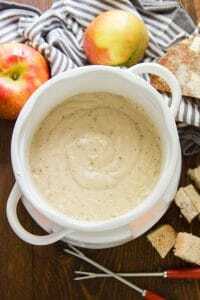 Vegan fondue is only possible, it's pretty darn easy and incredibly delicious to boot! 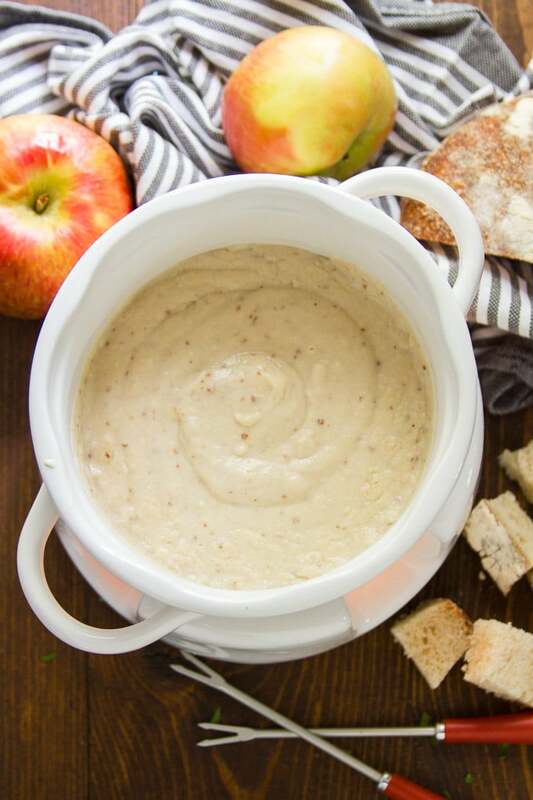 Smooth, creamy, and so luxurious...you'll want to dip everything in this stuff. Place the cashews and potato into a small saucepan and cover with water. Set over high heat and bring the water to a boil. Lower the heat and allow the water to simmer for 20 minutes. Remove the pot from heat and drain the water. 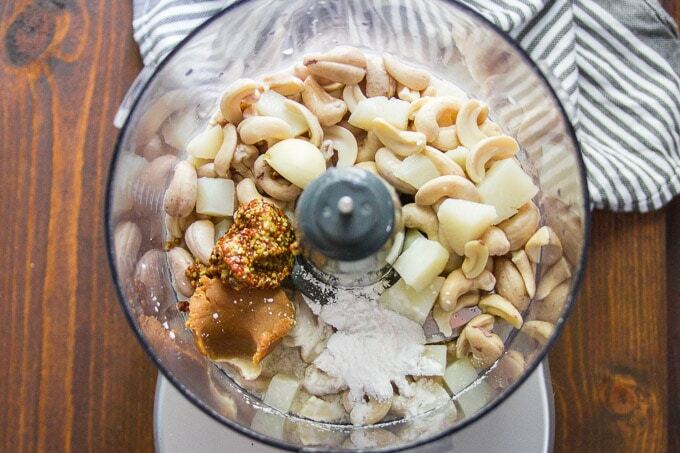 Transfer the cashews and potato to the bowl of a food processor fitted with an s-blade. Add the garlic, miso, mustard, lemon juice, tapioca starch, white pepper, and 1/4 cup of the non-dairy milk. Blend to form a smooth paste, stopping to scrape down the sides of the bowl as needed. Add another 1/4 cup of milk and blend again, until smooth. Add the remaining 1/2 cup of milk and blend again, until smooth. Pour the wine into a medium pot and set over high heat. Bring the wine to a boil. Lower the heat and allow the wine to simmer for 4 minutes, until reduced by about half. Stir in the cashew mixture and bring everything back up to a simmer. Allow the mixture to simmer for about 4 minutes, until it thickens up just a bit and becomes a bit more elastic. 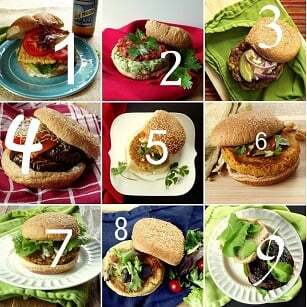 Taste test and season with salt to taste, if needed. Transfer the mixture to a fondue pot and serve with dippers of your choice. Wow, what a great idea! Will definitely try! Do you happen to know from where you got the cachellon (pot) that is pictured here? It was actually a gift from my mom. She got it about 15 years ago, so I’m sure she doesn’t remember. Sorry! I’ve seen them at department stores and places like Homegoods. I hope you enjoy the fondue! Made a double batch of this tonight. It is so darn good. We’re using it as the “cheese” component on vegan beet root reubens tomorrow for St. Paddy’s day! https://www.foodnetwork.com/recipes/food-network-kitchen/beet-reuben-4587830. Will definitely use this as a fondue in the future, too. What a great idea! I’m glad you like it!! Hi, great recipe, I was just wondering… does this freeze ok? Some of my different recipe attempts have gone a bit funky after thawing them back out! Thanks Max! I’m glad you like it. :) I’m afraid I’m not sure! I usually have luck freezing cashew-based cheeses, but potatoes can sometimes change in texture after freezing. Do you think you can replace the Cashews with Tofu. I don’t eat nuts or seeds. What do you think? It could work! I’m afraid I haven’t tried it so I can’t be certain, but it sounds like a reasonable substitution to me.